At least eight groups currently produce rankings of states and cities that are widely cited by public officials and businesses as grounds for changing public policy to enhance a state's prospects for growth. Are these rankings scientific? Do they have biases? Do they work as predictors of economic activity? The major indices analyzed in EPI's new study, Grading Places, have one point of view in common--they all advocate that places cut taxes, shrink government, and reduce regulations. 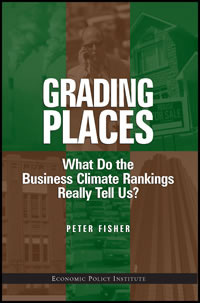 Find out why none of these "business climate rankings" are of any value for shaping these important policy debates.